PLEASE NOTE: The Baader T-2 Maxbright Mirror Diagonal consists of a diagonal body with mirror only. It is provided as a basic component, without any nosepiece or eyepiece holder. It incorporates standard T-2 threads at the input (female T thread on the telescope side) and output (male T thread on the eyepiece side) faces. This permits the diagonal to be used as a compatible component along with the other Baader Planetarium T-2 adapters and accessories. Baader Planetarium has just expanded their innovation in star diagonals. With their ground-breaking introduction several years ago of their all-dielectric 2" Maxbright star diagonal, Baader brought mirror star diagonals into the 21st century. Now, the mid-size, flexibility, and cost of the T-2 Maxbright Mirror Diagonal make this the ultimate diagonal for high power planetary viewing, or in systems where back-focus or space is limited and a full aperture 2" diagonal will not work or is not flexible enough. One of the key features of T-2 diagonals - be it prisms or mirrors - is the large free aperture and the flexibillity to directly adapt onto almost any telescope system, without the bottleneck of a 1.25" barrel size which may cause vignetting in long focal length 1.25" eyepieces or when working with a binoviewer on top of the diagonal. That is precisely why Baader offers the body of all their T-2 System diagonals without adapters. The new T-2 Maxbright Mirror Diagonal uses the proprietary Baader Maxbright all-dielectric mirror coatings on a sital-ceramic glass substrate. This process results in an amazingly high 99% photo-visual reflectivity. The unique Baader coating system has also been specifically optimized to minimize scatter, and does not degrade mirror flatness. The zero expansion mirror substrate retains its true 1/10 wave (p-v) flatness over the entire oversized 35mm (1.38") mirror surface! This allows the mirror to be used well in front of the image plane with no image degradation or astigmatism from a warped mirror surface. In addition, the extreme coating hardness makes the Baader Maxbright highly durable (the coatings are harder than the glass itself!). The Maxbright mirror coatings will last lifetimes without losing reflectivity, and may be cleaned with normal care, without fear of scratches. Modular T-2 System Design: Like its correct-image sibling (the Precision Amici Diagonal), the design of the T-2 Maxbright Mirror Diagonal enables it to be configured to exactly suit your needs. The input and output T-2 threads integrate with the full range of Baader Astro T-2 System components and other T threaded adapters. The telescope side can hence be configured to fit in 2" or 1.25" focusers, as well as directly on telescopes with specific threads such as original M44 Zeiss threads, Vixen OTAs or Russian Maks. 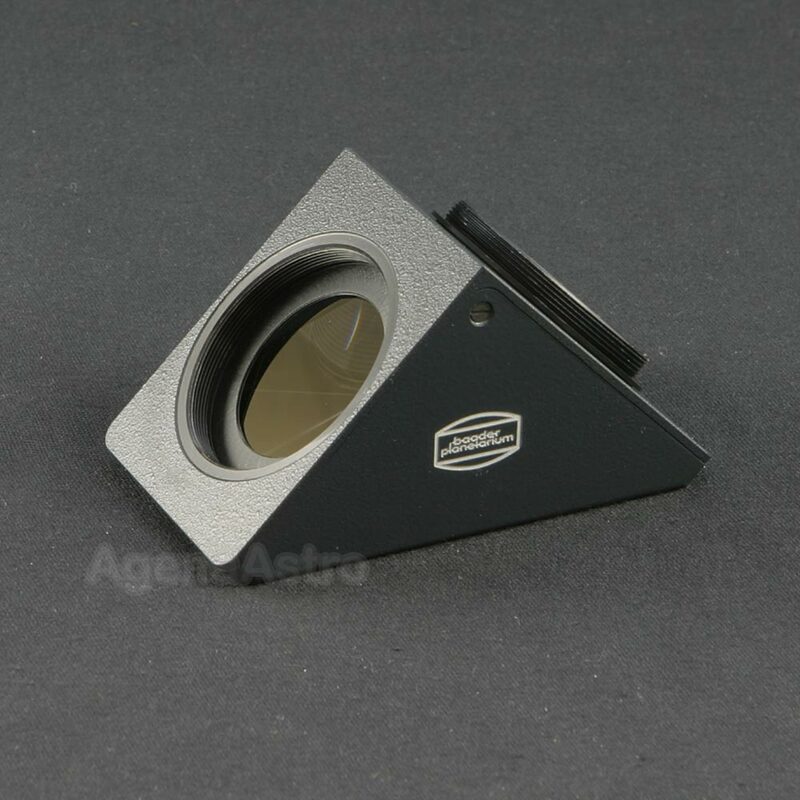 The eyepiece side can be used with Baader's quick change ring #6 in order to mount the Mark V binocular viewer instead of an eyepiece (in order to achieve the shortest possible backfocus distance between telescope and binocular viewer) or alternatively mount 1.25" or 2" eyepiece holders. It is also the perfect diagonal for use with the Baader / Zeiss Giant Binoviewer (replaces the normal prism diagonal). Not just a visual accessory, this diagonal also integrates well into digital imaging applications. The effective optical path length of the base T-2 Maxbright Diagonal is 54mm. Like all the Baader Planetarium products, the mechanical quality and finish are superb. The all-machined aluminum housing supports the mirror at the correct location and at a precise 45 degree angle, to maintain the collimation and performance of your optical system. Even the tiniest exposed lips are sharp V-threaded for stray light control. Review by Kevin Barker of Auckland, New Zealand. Outstanding quality. Works great with my Zeiss APQ130, Intes 815 and also my venerable Meade 8 inch SCT. Lightweight with a larger aperture than the generic 1.25 inch. Has taken extremely high mag and not shown any signs of image deterioration when star testing with an excellent Intes 815. Works great with the T-2/1.25 inch adapter. Takes T-2 accessories so I can use this with a bino viewer to suppress CA a little if required. Not cheap but heh a one off purchase. I also have the two inch Baader version. Agens are good to deal with, they ship effectively without overcharging on shipping.